This is a list of the National Register of Historic Places listings in Cochise County, Arizona. It is intended to be a complete list of the properties and districts on the National Register of Historic Places in Cochise County, Arizona, United States. The locations of National Register properties and districts for which the latitude and longitude coordinates are included below, may be seen in a map. There are 86 properties and districts listed on the National Register in the county, including 8 that are also National Historic Landmarks. (#94000078) 100 and 200 blocks of W. 6th St.
31°54′59″N 109°16′23″W﻿ / ﻿31.916389°N 109.273056°W﻿ / 31.916389; -109.273056﻿ (Barfoot Lookout Complex) Portal Constructed by the CCC in 1935, Barfoot Lookout on the Coronado National Forest in Arizona was active for more than 65 years. It was a 14’x 14’ L-4 ground house with a roof-catch cistern once common in the dry Southwestern forests. This lookout was destroyed in the Horseshoe II fire in June 2011. Only the foundation remains. (#83002985) South of Bowie off Apache Pass Rd. (#94000079) 200 and 300 blocks of E. 3rd St.
(#15000168) 315 W. 5th St.
(#12000853) Junction of Willson Rd. & Newell St.
(#08001020) 12856 E. Rhyolite Canyon Rd. 32°00′20″N 109°21′24″W﻿ / ﻿32.00569°N 109.35672°W﻿ / 32.00569; -109.35672﻿ (Chiricahua National Monument Historic Designed Landscape) Willcox Encompasses improved portions of the National Monument. (#87000748) 175 S. Railroad Ave.
(#85000146) Roughly bounded by Pan American, H, and F Aves. along 8th, 10th, 11th, 12th, and 13th Sts. and G Ave.
(#75000336) Eastern end of 10th Ave.
(#86002095) Roughly bounded by 12th St., Carmelita Ave., 7th St., and East Ave.
(#87001793) Roughly bounded by the western side of H Ave. between 6th and 9th Sts. 31°21′01″N 109°33′17″W﻿ / ﻿31.350278°N 109.554722°W﻿ / 31.350278; -109.554722﻿ (Douglas Underpass) Douglas Built in 1936 as a part of the Works Projects Administration for historic U.S. 80 under the tracks of the Southern Pacific Railroad; demolished in 1999. It became a national historic site on September 30, 1988. 31°25′05″N 109°52′37″W﻿ / ﻿31.418056°N 109.876944°W﻿ / 31.418056; -109.876944﻿ (Walter Douglas House) Bisbee Also known as Loma Linda. (#86000792) 14th St. and H Ave.
(#84000647) 1000 Pan American Ave.
(#87000749) 210 S. Austin Blvd. (#94000074) 398 E. 4th St.
(#94000073) 180 San Pedro St.
(#83002987) 180 N. Railroad Ave.
(#94000072) 363 W. 4th St.
(#04000718) Fronting 4th St., between Cedar and Spruce Sts. (#78000541) Ghost Town and Pearce Rd. (#87000751) Roughly bounded by Curtis Ave., Stewart St., Southern Pacific railroad tracks, and Grant St.
(#94000076) 146 E. 6th St.
(#02000032) 592 E. Safford St.
(#71000111) Safford and 3rd Sts. (#09000608) 6396 N. Schilling Ranch Rd. (#83002986) 124 E. Stewart St.
31°54′20″N 109°11′56″W﻿ / ﻿31.905556°N 109.198889°W﻿ / 31.905556; -109.198889﻿ (Silver Peak Lookout Complex) Portal An L-4 type lookout house measuring 14 feet square. Built in 1938 by a CCC crew. Part of National Forest Fire Lookouts in the Southwestern Region TR. Listed on National Register on January 28, 1988. Burned down in an October, 1992, thunder and snow storm. Only a foundation remains. (#04000720) 1835 Old Ranch Rd. (#72000195) 315 E. Fremont St.
(#94000075) 305 E. 4th St.
(#14000242) Pan American Hwy. 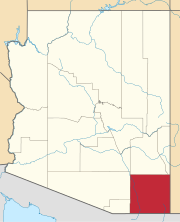 & 1st St.
Wikimedia Commons has media related to National Register of Historic Places in Cochise County, Arizona. ^ "Barfoot Lookout", nhlr.org 2013. Retrieved on 14 October 2014. ^ Patt, Jonathan. "Barfoot Lookout Trail" Archived 2016-03-18 at the Wayback Machine, Chiricahuatrails.com, 31 December 2013. Cached copy retrieved on 14 October 2014. ^ Hartman, Pamela. "‘Magic tunnel’ or ‘crooked road’? Underpass debate revs up Douglas", Tucson Citizen, Tucson, 23 October 1999. Retrieved on 6 October 2014. ^ "National Register of Historic Places Program: Weekly Register List 1988", National Park Service, Retrieved on 6 October 2014. ^ When listed in NRHP in 1987, address was 210 S. El Paso Ave.; see National Register Focus site. Street's name changed to Austin Boulevard in 1989: see "George Austin", Arizona Range News, 2010-04-28, retrieved 2012-02-26. ^ "Arizona State Historic Property Inventory: Morgan Home". Retrieved 2015-03-05. ^ "Lookouts in the Southwestern Region. Cultural Resources Management Report no. 8. USDA Forest Service Southwestern Region. Sept. 1989. ", USDA Forest Service, Southwestern Region, Retrieved on 9 July 2015. ^ "National Register of Historic Places Inventory - Nomination Form 12/14/87", National Park Service, Retrieved on 9 July 2015. ^ "National Register of Historic Places, 1966-1994", National Park Service, Retrieved on 9 July 2015. ^ "Silver Peak Trail #280, AZ", hikearizona.com, Retrieved on 9 July 2015. This page was last edited on 28 April 2018, at 19:57 (UTC).